In past years, we were able to fund mortgages for American citizens purchasing vacation property in Mexico. The two financial conduits which provided the source of that capital were GMAC-RFC and GE Capital. Both sources stopped funding those loans in 2006-7 and our offerings, for Americans purchasing vacation property in Mexico, have been discontinued indefinitely. Banco Santander SA said its Mexican unit agreed to pay 2 billion pesos ($162 million) for the mortgage operations of General Electric Co. to become that country’s second-largest home lender. Santander will gain a portfolio of about 24 billion pesos in the deal, which will be completed in the first half of 2011, the Madrid-based bank said today in a statement to Mexico’s stock exchange. Santander agreed to pay undisclosed financing costs, according to the statement. I am unaware of how GMAC-RFC is handling its portfolio but it is my understanding that they have discontinued the Mexican mortgage product for Americans. Loans were also offered through New South Federal until its seizure by the FDIC, one year ago. Investors with money stuck in an IRA,or old employer's 401-k account, have traditionally shunned real estate as an investment. Custodial fees were high and there was no way to leverage the property through an IRA. There may be a solution. Think The Mortgage Market Is Upside-Down? Upon entering the construction, visitors have reported feeling dizzy and disorientated. Although the house is safe, Mikiciuk said nobody would inhabit it permanently and it was meant purely as an exhibit. If you're searching for a home loan, and find that the mortgage market completely opposite of what you experienced in 2005, maybe you won't feel so um...disoriented now. 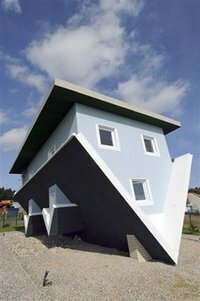 Photo Credit: AP Photo: An upside down house is seen in Trassenheide, Germany, Thursday, Sept. 4, 2008. European investors have a double bonus with an investment in California real estate as the dollar sinks to an all-time low against the Euro. I'm going to explain how a weakened US Dollar can benefit a foreign investor should they buy real estate in California. Five years ago, $100,000 was equal to 100,000 Euro (the currency in Europe). Today, that $100,000 is only worth 72,000 Euros. A foreign investor can withdraw 72,000 Euros and convert it to $100,000 to use for a down payment on a Downtown Long Beach condomium. That property may have cost as much as $360,000 two years ago but is selling today for $300,000. This hard money lender describes what they do as "situational lending" which is a true representation of what a traditional hard money lender does. Unique niches Kennedy Funding states that they will fund are raw land and properties in Mexico. They are aggressive with large developments and commercial financing. I have been contacted by them 2-3 times and have not funded a loan with them so I am unable to comment on the efficacy. I posted this because many mortgage brokers on Active Rain look for vacant land loans. I hope this helps. Contact me at 858-699-4590 if you need financing for a Mexico property. Have you ever considered a home on the Red Sea? Do you even know where the Red Sea is? Sharm El Sheikh is located at the tip of the Sinai Peninsula, in Egypt, where the Gulf of Suez and Gulf of Aqaba meet. It is oft called the "City of Peace" because it was the site for many peace summits. It was formerly a commercial fishing port but has morphed into the "green capital' of the Middle East. The Red Sea has militant environmental laws and prohibits the taking of marine wildlife. All is not peachy there. In 2005, 64 people were killed by a suicide bomber in the "Old Market" section of the city. Israel has issued a terrorism warning because of the bombings.Surprisingly, tourism has not dropped. Sharm El Sheikh is considered the yachting and diving capital of the Red Sea. Less than 3 hours away is Mount Sinai, the location where Moses was given the Ten Commandments. I have to think that's a must see if you consider property there. I mean, why not visit the original source for the legal system while you're there? Red Sea Real Estate has a site that aggregates the property listings and new developments for you. They claim that their real estate network is comprised of agents who are Graduates of the Realtor Institute (GRI), a prestigious designation in real estate brokerage. They maintain a weblog highlighting these offerings and have started to become frequent commenters in the real estate weblog world. Their office is on Neama Bay, near the KFC, McDonald's, Pizza Hut, and Hard Rock Cafe.